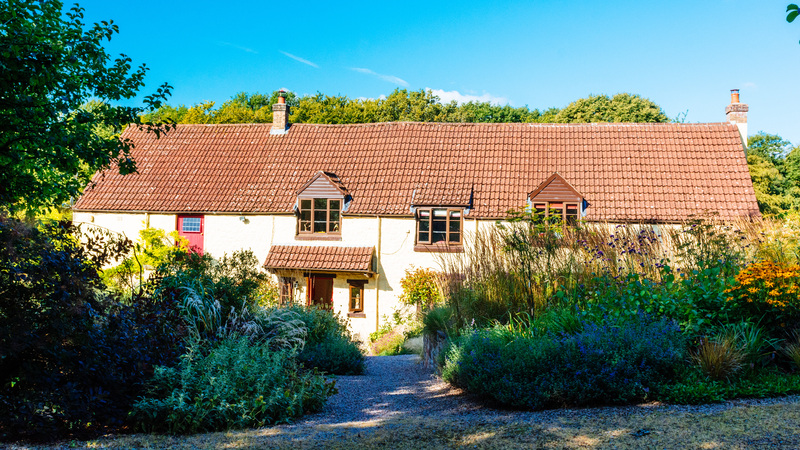 The garden at Barn House is located on a secluded hillside above the beautiful Wye Valley. Surrounded by meadows and woodland, it’s been an inspiring place to create a garden. The result is bold plantings of ornamental grasses and other resilient flowering perennials. The acre garden is divided into two, with the house sitting at the bottom of what was a rocky slope. Storm drainage was installed in 2006. In the process 100 tonnes of red sandstone were excavated. The biggest challenge has been how to prepare areas for planting. On the other hand, the site is south facing and catches the valley winds which makes it ideal for growing ornamental grasses. Since we moved here, in 2006, we’ve propagated large numbers of plants from seed or by division. This has been both a rewarding experience and an affordable way to stock the garden’s mass plantings. This was the easiest place to start as it was already divided into smaller and more manageable areas. It also had the best soil, a rich if heavy clay that was prone to become waterlogged. This sunken patio’s dated landscaping was retained, just softened by using potted plants. The main border was remodelled from what, in the 1970s, had been a trout-pond-come-swimming-pool and since the 1980s had been filled in to make a large shrubbery. After several years of neglect, it was infested with bindweed and ground elder. We divided it up into quartered beds, the soil was dug out and sifted by hand. 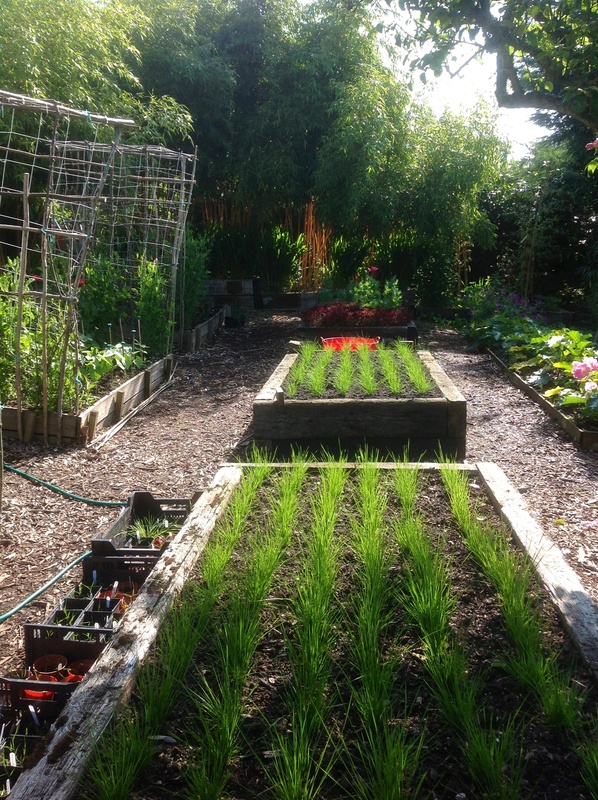 A flat piece of land in the orchard was turned into a vegetable garden. It’s been a useful area to raise the large number of plants required for development of the front garden. To provide shelter we hedged the area with the giant bamboo Phyllostachys vivax. The bamboo is contained in raised sleeper beds, lined with root barrier. By 2011, with a full structural plan in place, planting schemes and plant lists were finalised for the two main elements in the design. This time, machinery was brought in to trench and riddle the new planting areas. The first element, was formally landscaped using local red sandstone. The aim was to improve the aspect from the house. For one month or so of the year, when the grasses are cut back, the curving stone terraces are on show. They redress the slope and provide soil depth in what was the rockiest part of the garden. But, for almost 10 months of the year, the terraced planting does its job and changes dramatically as the seasons pass. The mainstay of this planting is Calamagrostis x acutiflora ‘Karl Foerster’, a dynamic and easy to grow grass. It’s both architectural and a useful foil for a range of perennials including persicaria, rudbeckia, nepeta, geraniums and veronicastrum. On the far side of the terrace, bordering the drive, is a winter garden of multicoloured cornus and silver birches underplanted with varieties of evergreen luzula and carex. The second element in the design was to enclose a sizeable area for the dogs to bound around in. A 70 metre long hedge of Miscanthus sinensis ‘Malepartus’ screens the dogs’ paddock from the lane, and Miscanthus sinensis ‘Starlight’, a dwarf variety, acts as a low hedge around a west facing raised seating area. The third element, planted in spring 2015, is a stylised ‘meadow’ of Deschampsia cespitosa and Molinia caerulea subsp. arundinacea dotted with perennials. The grasses in this area have a wild and billowing nature, all were grown from seed. In 2018 Barn House Garden is open under the NGS June to August, please call or email Kate if you’d like to visit the garden.